Armourflow Coated Metal is a 2.4mm thick PVC faced steel sheet specifically developed to be site-formed into high performance gutter sections. Each composite sheet incorporates a 1.2mm thick Armourplan PVC membrane, factory bonded to a 1.2mm thick steel substrate. Together, they form a single ply material that is extremely resilient, yet malleable enough to accommodate almost any architectural requirement. 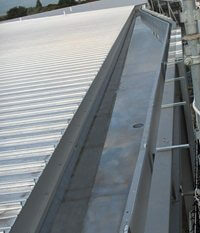 Designed to provide the ultimate combination of site efficiency with superb drainage characteristics, Armourflow Coated Metal gutters can be installed in up to half the time of traditional membrane gutters due to a simple but important feature; the Armourplan PVC membrane overlap that extends 75mm beyond the steel substrate at one end. In traditional membrane gutter systems each sheet of membrane needs to be jointed to the next sheet with a separate PVC strip. Hot air welding each of these joints consumes valuable time and creates a point of potential weakness in the gutter. Armourflow Coated Metal’s 75mm overlap eliminates this joint strip entirely, saving material and labour costs. The environmentally friendly PVC bonded to every sheet of Armourflow Coated Metal has an ultra-smooth sealed finish that promotes the free flow of water and maximises drainage efficiency. The smooth PVC finish reduces the build up of silt and debris in the sole of the gutter, maximising out-flow rates and reducing maintenance.